Mod Podge is a commercially produced craft paste used for sealing paper products, including collages and decoupage. While Mod Podge dries into a clear, matte finish, you can use a mixture of corn syrup and starch to create a shiny alternative at home. Nearly anyone can use basic kitchen supplies to make a nontoxic and inexpensive craft paste. 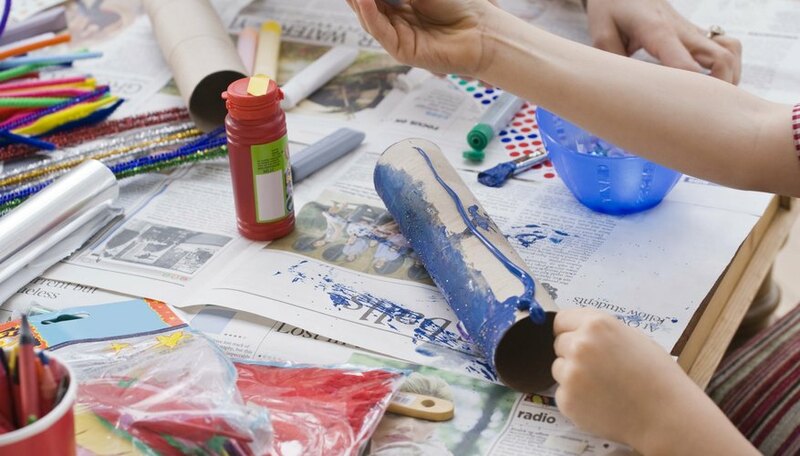 Avoiding artificial ingredients protects children from inadvertent exposure to chemicals while using paste for decoupage or creating collages. Measure 2/3 cup water and place into the saucepan. Add 2 tbsp. corn syrup and 1 tsp. white vinegar and place on a stove over medium heat. Bring the mixture to a boil, stirring frequently with the whisk, and remove from the heat. Whisk 1/2 cup corn starch and 3/4 cup water in a bowl until completely blended. Add to the saucepan with 4 drops wintergreen essential oil and stir until blended. Allow the mixture to sit undisturbed until it reaches room temperature, about 1 to 2 hours. Pour the cornstarch paste into the pint jar and close the lid. Allow to sit overnight or for about 8 to 10 hours. Keep the mixture refrigerated between uses. Apply the paste as a sealant or adhesive to paper crafts, allowing projects to dry for about 60 to 90 minutes without disruption.